Certificate Assessment | Qualys, Inc.
Assess your digital certificates and TLS configurations. 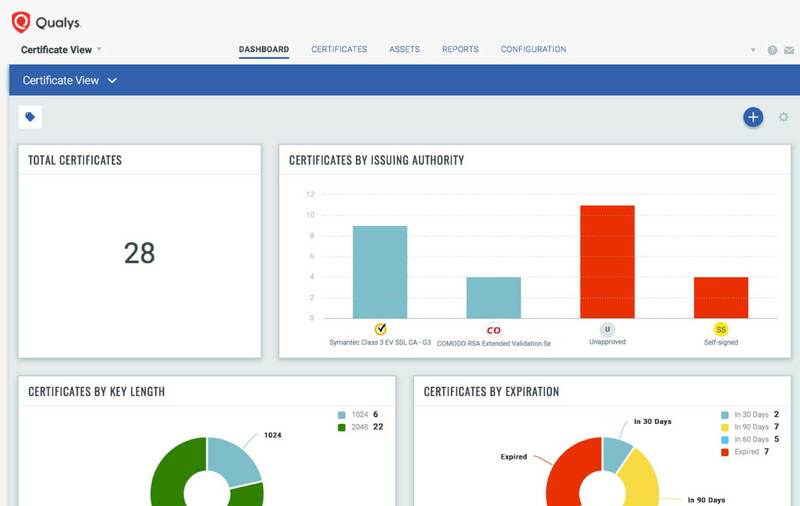 Qualys Certificate Assessment generates certificate instance grades using a straightforward methodology that allows administrators to assess often overlooked server SSL/TLS configurations without having to become SSL experts. Certificate grades reflect the strength of the underlying application or service configuration, and pinpoint specific configuration settings that highlight the use of best practices or lack thereof. It also allows you to quickly remediate cipher suites, protocols and key exchange parameters on the underlying endpoints. 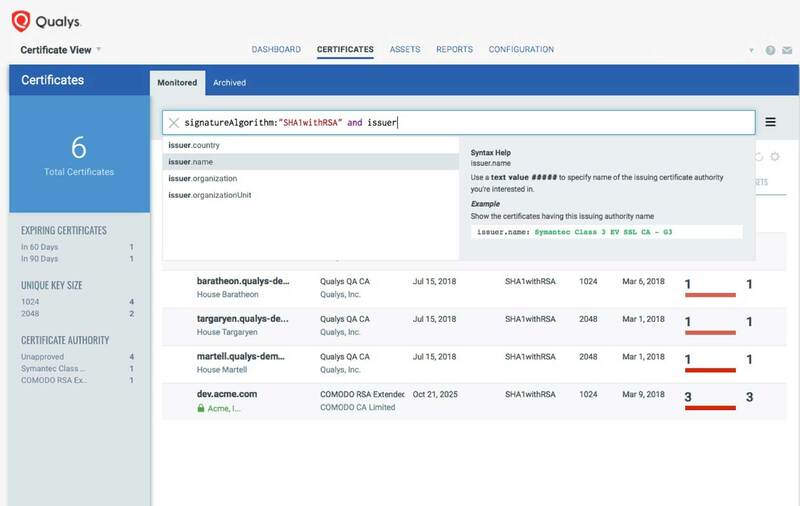 Qualys Certificate Assessment identifies out-of-policy certificates with weak signatures or key length, and shows you how many unique Certificate Authorities were found in the environment and how many certificates each one issued. 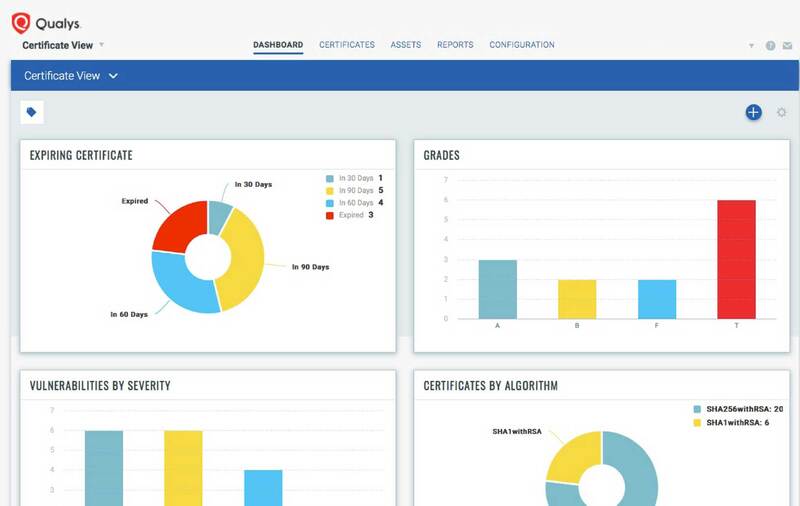 Working in tandem with Qualys Certificate Inventory, which is included for free, it performs continuous and complete detection and cataloging of every certificate from any Certificate Authority. Certificate Assessment continuously correlates certificate and configuration information with vulnerability data, so that your remediation prioritization decisions are rooted in accurate, up-to-date, applicable data, not in outdated spreadsheets or arbitrary schedules. That way, you’ll stay a step ahead of the hackers, replacing certificates and fixing underlying TLS vulnerabilities before bad guys exploit them.